The Canary Islands are a Spanish archipelago located just off the northwest coast of mainland Africa, 100 km west of the border between Morocco and the Western Sahara. The islands are (from largest to smallest): Tenerife (capital is Santa Cruz de Tenerife), Fuerteventura (capital Puerto del Rosario), Gran Canaria (capital Las Palmas de Gran Canaria), Lanzarote (capital Arrecife), La Palma (capital Santa Cruz de La Palma), La Gomera (capital San Sebastián de La Gomera) and El Hierro (capital Valverde). The islets are La Graciosa, Alegranza, Montaña Clara, Roque del Este, Roque del Oeste and Isla de Lobos. The islands are a major tourist destination attracting over 12 million visitors a year with Tenerife, Gran Canaria and Lanzarote the most popular. The islands have a sub-tropical climate, with long hot days in summer and cooler days in winter. The Canary Islands are volcanic, mountainous ocean islands, some are still active today. They are home to many unique species and are the fourth natural region in the world for endemic flora with 1700 reported higher plant species, more than 6000 species of invertebrates and 109 species of vertebrates. La Palma is the most northwesterly of the Canary Islands and is the fifth largest. The capital is Santa Cruz de la Palma. La Palma's geography is a result of the volcanic formation of the island, the highest peaks reach over 2,400 m above sea level while the base of the island is located almost 4000 m below sea level. There is road access from sea level to the summit which is marked by an outcrop of rocks called Los Muchachos ("The Lads"). This is the site of the Roque de los Muchachos Observatory, one of the world's premier astronomical observatories. Spain Hotels. This page lists hotel accommodation in La Palma and/or closeby. If you are travelling to La Palma for business or pleasure please choose from our selection of hotels in La Palma Canary Isles Spain. This complex boasts traditional Canarian design and architecture and an outdoor swimming pool. Set on the island of La Palma, Apartamentos La Caleta is only 500 metres from the sea. The apartments at La Caleta are all south-facing and come with a balcony or terrace and a safe. They are cleaned 3 times a week. All apartments have digital TV. The La Caleta complex has spacious garden areas and a solarium by the pool, which can be accessed via the bar-restaurant. There is also a children's pool, play area and mini-golf. 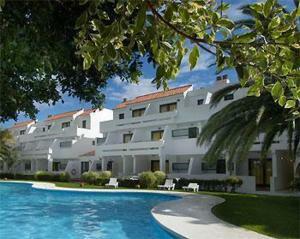 The Apartamentos La Caleta is located in the popular resort of Los Cancajos. The airport is 2 km away and the capital city, Santa Cruz de la Palma, is within 4 km. Enjoy breathtaking views out over the Atlantic Ocean from the hillside setting of this aparthotel, located 400 metres above the beaches of Brena Baja on the tropical island of La Palma. At Los Molinos you can take a dip in the outdoor swimming pool at the same time as enjoying the amazing sea views. You can even gaze out over the ocean from the private terrace of your own charming, spacious apartment. Surrounding the aparthotel you can relax in the green setting of Montana La Brena. Soak up the sun from the nearby beach of Los Cancajos, 5 minutes away by car. You can also easily reach the island capital of Santa Cruz de La Palma, 10 minutes away. Set 500 metres from Los Cancajos Beach, this peaceful aparthotel is built around an outdoor swimming pool and attractive gardens - the ideal base to explore the tropical island of La Palma. Los Rosales provides spacious apartment accommodation for families or groups of friends, just 4 km from the island capital of Santa Cruz de La Palma. It lies just off the coast at Brena Baja, a beautiful spot where you can enjoy a tranquil day on the beach and in the clear Atlantic waters. Enjoy the year-round sunshine in Los Rosales' pretty gardens before diving into the outdoor swimming pool. Around the pool you will find sun loungers, allowing you to sunbathe in comfort. One- or 2-bedroom apartments all come with a separate lounge and kitchen. Each one opens onto its own terrace where you can enjoy the sunshine in privacy. Aparthotel Las Olas is a 7-minute walk from Cancajos Beach, and a 3-minute drive from La Palma Airport. The complex features outdoor swimming pools, a gym and free Wi-Fi zone. All apartments Las Olas Aparthotel have a balcony or terrace and a living area with satellite TV. Guests can cook in the well-equipped kitchens, and there is a handy mini supermarket on site. The aparthotel offers a large sun terrace with loungers and views of the sea and mountains. There is a paddle tennis court, beauty salon and massage service. Bicycle rental can be arranged at the 24-hour reception. Secure parking is available on-site and an airport shuttle service can be organised on request. Las Olas is less than a 10-minute drive from the island's capital, Santa Cruz de la Palma. This modern complex offers a range of comfortable and well-equipped apartments that are ideally situated a short walk away from the beach. 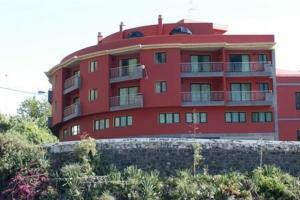 For an enjoyable stay on the volcanic island of La Palma, Aparthotel El Cerrito is hard to beat. During your stay you can unwind with a number of leisure facilities including a jacuzzi and separate pools for adults and children, making the apartments the perfect place to stay for a family holiday. All of these outdoor facilities are surrounded by the sights of the pleasant green vegetation and the sounds of water falling from the many water features. All of the apartments are spacious (82 sqm) and most of them come with a terrace or balcony and a wonderful sea view. 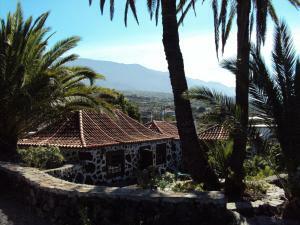 Aparthotel Brenas Garden is located in the town of Brena Baja, 1.5 km from La Palma's east coast. It has an outdoor pool with loungers and all apartments have a balcony. All apartments at the Brenas Garden have tiled floors and a fireplace. They consist of a twin bedroom, a seating area with sofa bed, a bathroom and a kitchen. The Brenas Garden Aparthotel is a 12-minute walk from the shops of San Jose, and 7 km from the beach at Los Cancajos. La Palma Airport is only 3 km from the Brenas Garden. These cosy apartments are situated a short distance from the town of Los Llanos, providing all services, shops and restaurants. The El Patio apartments boast 42 sqm of floor space and can accommodate up to 3 people. The El Patio apartments give you the freedom to come and go as you please. You can also cook your own meals in the apartments' well equipped kitchen before dining in an informal, relaxed atmosphere. This is the perfect option to explore this pretty island with your family or a group of friends. Los Llanos is the second most important city on the island and from here you can organise trekking excursions into the beautiful natural landscapes of La Palma. 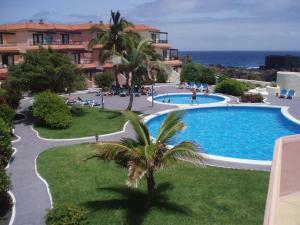 Apartamentos Isa are located just outside the village of Tazacorte, on the Canary Island of La Palma. The complex has an outdoor pool with loungers and offers spectacular sea views. All Isa apartments have a kitchenette and a living room with a sofa bed. Most apartments have a terrace which overlooks banana plantations and the Atlantic Ocean. Apartamentos Isa are just 1.5 km from the beach. It is also just a 15-minute walk to Tazacorte, a charming fishing village where there are various restaurants. It is also possible to go whale watching with a boat trip from the port. The mountainous La Caldera de Taburiente National Park is 7 km away from the complex. There is a direct bus connecting the complex with the city of Los Llanos de Ariadne, 7 km away. Casitas Rosheli are located in the hills just outside Llanos de Aridane, on La Palma. There is an outdoor pool and barbecue area, and apartments have free Wi-Fi and satellite TV. All Casitas Rosheli apartments are decorated with marble floors and Spanish-style light wood furniture. They all have views of the Los Llanos de Aridane Valley and the Atlantic Ocean. The kitchens are equipped with a microwave, toaster and coffee maker. Some also have a washing machine, while others have access to shared laundry facilities. The town centre of Llanos de Aridane is a 15-minute walk away. Here you can find the 16th-century Nuestra Senora de los Remedios Church. Situated in the centre of Llanos de Aridane on La Palma, this hotel offers functional rooms with satellite TV and a private bathroom. It features a large rooftop sun terrace. Valle Aridane offers bicycle rental and free internet is available in public areas. Guests can also take advantage of free parking at a nearby location. A buffet breakfast is available at Hotel Valle Aridane and there is a restaurant serving traditional dishes. Guests can also use the vending machines for drinks and snacks throughout the day. The nearest beach is just 3 km from Valle Aridane Hotel. La Palma Airport can be found 30 km away. Situated just outside La Palma's Los Llanos de Aridane, the family-run Adjovimar Apartments offer an outdoor pool and a small gym. Each apartment has satellite TV with international channels. Apartamentos Adjovimar are surrounded by tropical gardens and fruit trees. There is a sun terrace with views of the nearby La Caldera de Taburiente National Park. All Adjovimar apartments have a living-dining room with a well-equipped kitchenette. Fans, DVD players and safes are available to hire from reception. The apartment complex has a small cafe and a supermarket. There are also various shops and restaurants within a 5-minute walk. Free parking is available at the Adjovimar, and Puerto Playa Beach is less than 15 minutes' drive away. Bungalows El Castano are located in the El Paso district of La Palma and features an outdoor swimming pool surrounded by attractive gardens. The simple accommodation includes a furnished terrace. The bungalows include a kitchenette with a fridge and kitchenware. The lounge area comes with sofas. El Castano offers a bicycle and car rental service so guests can explore the island. The tour desk can provide useful information on the area. The El Paso district lies in the middle of the island and contains many beautiful areas, including the Caldera and the Cumbrecita. Los Llanos de Aridane is 1 km away from the bungalows. Set overlooking the tranquil Puerto Naos beach, this 4-star hotel complex is located in a small town on the west coast of the island of La Palma. Sol La Palma has a wealth of facilities that can help you unwind while on holiday. Take a dip in one of the complex's swimming pools to cool off in the hot Canarian sunshine. You can also get more active and do some exercise in the hotel gym, followed by a relaxation session in the spa centre. The local area is ideal for outdoor activity enthusiasts. You can rent bikes to explore the island or go scuba diving just opposite the hotel. Sol La Palma is located 8 km from Los Llanos de Aridane and 35 km from the airport and Santa Cruz de la Palma. Built and inaugurated in 1990. Set overlooking the tranquil beach of Puerto Naos and the Atlantic Ocean, Sol La Palma is a large aparthotel complex, with excellent facilities, ideal for a holiday with family or friends. Take a dip in one of the 2 swimming pools in the complex, which boast sea views. You can get more active by doing some exercise in the hotel's gym. The Sol La Palma resort also organises a variety of day time activities, such as fitness or photography clubs. Relax your body in the onsite spa - which has a range of treatments, a whirlpool and a sauna. Sol La Palma Apartments is located 8 km from Los Llanos de Aridane and only 35 km from the airport. Just 2 km from the coast and with fantastic ocean views from their hill-top position, these apartments are decorated in a delightful rustic-style and surrounded by pretty gardens. The Colon properties are built in a typical Canarios style with rustic stone or white-wash walls, terracotta roofs and large, French windows. Soak up the sunshine and enjoy the exotic plants on the tiled patios, while sitting on attractive garden furniture. Here you can also enjoy your dinner during the long summer evenings after cooking up a feast in the kitchen. Gaze at sea and volcano views while you dine. In just 10 minutes by car, you can be sunning yourself on La Palma beaches with their famous black sands. Refresh yourself with a swim in the Atlantic. Located just a short distance from Zamora beach, Teneguia Princess is a smart and spacious complex set in a beautiful landscape, boasting views of the beach, sea and volcanoes on Isla de La Palma. Equipped with magnificent swimming pools, this is the perfect place to spend the day relaxing and soaking up the sunshine, while the children take a refreshing dip. You can also go for a session in the spa centre, which includes thermal circuits and treatments. Get some exercise in the on-site gym, before heading back to your room to freshen up and get some rest. In the evening, you can head to one of the numerous on-site restaurants, where you can sample local-style cuisine or pizzas and snacks. Then, head to one of Teneguia Princesss bars, where you can savour a cocktail, beer or soft drink, in the elegant atmosphere. La Muralla is a small complex of 11 apartments located in a unique point, next to the Puerto Naos' view point, and 1 km from the beach. The Apartments where totally refurnished on 2005, and are complemented with a swimming pool with massage cascade, wide private sun terrace with sea view and west facing. All of our apartments have equipped kitchens, satellite TV, safe deposit, extra cot and beds under request, parking and welcome products. 'A' apartments have 2 bedrooms and 'B' apartments have 1 bedroom. 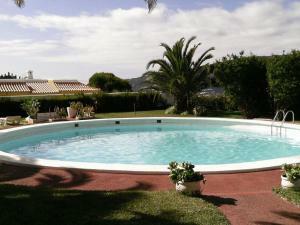 Set in rural La Palma, Apartmentos Finca el Gallo has a sun terrace and gardens. Apartments include satellite TV, CD players and balconies with sea and mountain views. Each Finca El Gallo apartment has spacious living room with a sofa bed. The kitchens include a hob, fridge and toaster, as well as a washing machine. The El Gallo complex has a 24-hour reception, where guests can book a massage. Staff can arrange car and bicycle rental or provide information about the island. Finca El Gallo is situated in Todoque, just 2 km from Playa Nueva Beach. Free public parking can be found near the apartments, and local bus services stop nearby. There are various shops and restaurants within a short walk. Set on the Canary Island of La Palma, Bungalows Morani offers beautiful views over the sea and mountains and free parking. Bungalows feature a furnished terrace with shower and BBQ. Each bungalow at Morani comes with a CD player, safe, satellite TV and a kitchenette with tea/coffee maker. The bathroom is equipped with a hairdryer. Internet access is offered at a good price. Bungalows Morani's 24-hour reception can arrange car rental and book excursions. There is also an on-site gift shop, a garden and a children's playground. The Morani complex is a 5-minute drive from Puerto Naos Beach, 200 metres above sea level. Apartamentos Villa Colon feature an outdoor swimming pool, sun terraces and gardens. Set in La Palma's Fuencaliente region, they offer wonderful sea views and a free airport shuttle service. Each Villa Colon apartment has a private balcony with views of the Atlantic Ocean and La Palma's famous volcanoes. Apartments have a living-dining room with satellite TV and a kitchen with hob, fridge and coffee-maker. Surrounded by peaceful countryside, the Villa Colon complex is 7 km from Zamora Beach. The Cumbre Vieja Natura Reserve is within 2 km. Guests can hire a car from the complex, and free private parking is available on site. Located in the town of Quemados, in the south of La Palma, Finca Colon offers traditional Canarian apartments and bungalows set in attractive gardens. The complex has a swimming pool. The spacious apartments and bungalows at Colon all have private balconies or terraces. Many enjoy wonderful views of the sea or volcanoes. They also have a kitchen with stove and fridge-freezer. The restaurant at Apartamentos y Bungalows Finca Colon, Puesta del Sol, is set next to the swimming pool. It offers traditional Canarian dishes and sunset views. There is also a bar. Located on the main seafront promenade of Puerto Naos Beach, the Apartamentos Martin features simple accommodation with a balcony and sea or mountain views. The complex offers bicycle and car rental. The apartments include a kitchen with a fridge, and tea and coffee maker. The lounge area comes with a sofa bed and satellite TV. Martin Apartments offer vending machines for drinks and snacks. There are also many bars and restaurants within walking distance in the Puerto Naos resort in La Palma. A bus stop is conveniently located just 10 minutes' walk from the apartments with a regular service to Los Llanos. The airport is approximately 1 hour away. Casa Las Dos Palmeras is a small complex of 3 villas, set in Todoque, 2 km from the beach. These country-style villas feature flat-screen TVs, terraces and sea views. The Dos Palmeras has traditional decor and its stone villas have tiled floors and wooden-beamed ceilings. Each villa has a spacious seating area with satellite TV. There is also a well-equipped kitchen and a dining area. The Palmeras is set in pretty gardens and guests can relax on its terrace. The complex is within walking distance of the centre of Todoque, where there are some shops and restaurants. Caldera de Taburiente National Park can be reached in 25 minutes, by car. The town of Puerto Naos is less than 4 km from the villas. These comfortable and practical apartments enjoy views of the sea and are situated only a few metres from the port and the monumental area of Santa Cruz de la Palma. The apartments are equipped down to the finest detail and have been designed to make your stay a comfortable and pleasant one. This is a tranquil base from which to explore the rich natural environment of the island. You can find plenty of information about cultural visits in the region and cuisine in this homely establishment. Hotel Taburiente Playa is 300 metres from Los Carcajos Beach, on La Palma's east coast. It offers 3 outdoor pools and free parking, as well as a gym, sauna and tennis courts. All air-conditioned rooms at H10 Taburiente Playa have a private balcony and satellite TV. The private bathroom comes with a hairdryer. The hotel's buffet restaurant offers show cooking and serves international food. There are also 3 bars, including a poolside snack bar and a salon bar with live music. Room service and packed lunches are available. The coastline around the hotel is popular for scuba diving, and there is a diving centre next door. You can drive to La Palma Airport and Santa Cruz de La Palma, the island's capital, in 10 minutes. Car hire and an airport shuttle service are available at the hotel tour desk. H10 Costa Salinas is located 300 metres from Los Cancajos Beach, 5 km from La Palma Airport. This aparthotel features tropical outdoor pools, a buffet restaurant and a poolside snack bar. Each bright Costa Salinas apartment has a balcony or terrace, some with sea views. Apartments have a bedroom, separate living area with TV and a kitchenette with an oven, hob and fridge. Hotel H10 Costa Salinas offers a relaxing cocktail bar in the lobby, and there is regular evening entertainment with live music and shows. Guests can also use the tennis courts and sauna at the nearby H10 Taburiente Playa. The H10 Costa Salinas is just 5 km from Santa Cruz de la Palma, the island's capital. The Caldera de Taburiente National Park is within a half-hour drive. Hotel Hacienda San Jorge offers free Wi-Fi in public areas, a sauna, a gym and a large seawater swimming pool. There is direct access to Los Cancajos Beach. The resort has a buffet restaurant with amazing sea views. There is a cocktail terrace, and tapas and snacks are available at the pool bar. Vegetarian options are also available. All apartments have a kitchen, satellite TV and a balcony or terrace. The resort was designed by Canarian painter Facundo Fierro and has typical design. Hotel Hacienda San Jorge is set just 3 kilometres from La Palma Airport. There is a bus stop 100 metres away. The island is famous for its black sand beaches. The local area is ideal for hiking. Practical facilities on site include a souvenir shop and currency exchange. A small apartment-complex, situated in a unique location surrounded by beaches and mountains, where you can relax in total tranquillity. Just 8 apartments set in 4000m where you are able to unwind in total tranquility and privacy. The beach has been awarded with the 'Blue Flag' category by the EU, which garantees the quality of its waters and beach. On your arrival you will find a welcoming gift from us of a basket of fruit, bottle of water and a bottle of local wine. 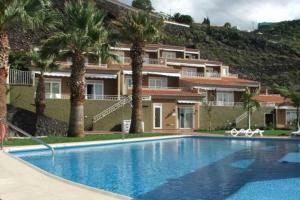 Apartamentos Miranda have a peaceful setting in Brena Alta, on the island of La Palma. These comfortable studios share an outdoor swimming pool, sun terrace and gardens. Studios at the complex have typical local decor. Each studio has a large balcony, with views of the mountains or the sea. Each Miranda Apartment also has a full kitchen. There is a living area with satellite TV. Free internet access is available in all apartments. The apartments offer a shuttle service to La Palma Airport. The city of Santa Cruz is a 10-minute drive away. Apartamentos Miranda also have tour desk and car rental service. Free private parking is available at the complex. Located just a short distance from the historical centre of the city of Santa Cruz de la Palma, this is ideal accommodation for a sun-filled family holiday. Apartamentos Rocamar come equipped with kitchens, so you can prepare your own meals. They also boast views of the street or sea. From here you can easily visit the city centre, and admire its typical Canarian buildings. The city is also the point of departure for excursions all over the island. Pension La Cubana is in the pedestrian area of the old town centre of Santa Cruz de La Palma. It is a 10 minute walk to the beach and the hotel offers free Wi-Fi. The rooms in the historic mansion of La Cubana have views either onto the pedestrian street or an internal patio. They are equipped with a sink and have access to a shared bathroom. This authentic hotel has a common room with cooking facilities. It is also located next to a number of squares, cafes and restaurants. Guests can experience Palmeran life as soon as they step out the door of La Cubana. There is a large free public parking area just 50 metres from Pension La Cubana. La Palma Port and main bus terminal are a 5 minute walk away. It also takes 10 minutes by bus or car to the airport. 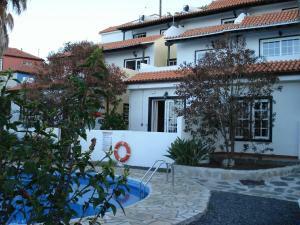 Apartamentos La Fuente are set in the Old Town of Santa Cruz de La Palma, just 50 metres from the sea front. This small apartment building offers free Wi-Fi access and a rooftop sun terrace. Each La Fuente Apartment has a bedroom, bathroom and a living area with satellite TV. The kitchen includes a hob, fridge and cooking utensils. Apartments are cleaned 5 days a week. The La Fuente complex is just a short walk from El Salvador Church and Santa Cruz's restaurants, bars and shops. The city is an ideal base for exploring the island of La Palma, or for taking a ferry to Tenerife. The apartments are a 10-minute drive or bus ride from La Palma Airport. Car rental can be organised at La Fuente, and Santa Cruz Bus Station is 800 metres away. Casa Chamiquela is located just outside Galga in north-eastern La Palma. It is a group of traditional Canarian villas with a terrace with views of the mountains and the sea. The Chamiquela villas feature a garden, tiled floors and wooden beams. They are also equipped with under-floor heating and a fireplace in the living room. The kitchens have a hob, microwave and coffee-maker. Each villa also contains a washing machine, TV and CD player. Fresh bread is served every morning at Casa Chamiquela. There is also an on-site shop selling artisan products such as goat's cheese, honey and wine. The Caldera de Taburiente National Park is 41 km away from Casa Chamiquela, and La Palma Airport is just 25 minutes' drive away. Apartamentos Lago Azul are set just a few metres from Los Cancajos Beach in Bena Baja. These apartments feature an outdoor swimming pool, terrace and apartments with sea views. The Lago Azul features simple decor, and the spacious apartments have a private balcony. Each has a seating area, and a kitchenette with a microwave and fridge. The Azul's restaurant serves a range of traditional Canarian cuisine and offers a daily buffet breakfast. Guests can enjoy a drink in the on-site bar. The apartments are ideally situated for watersports such as diving and water-skiing. Other activities include cycling and hiking. The Caldera de Taburiente National Park can be reached in around 45 minutes' by car. Hotel La Palma Romantica offers luxurious accommodation within the picturesque Laurisilva Forest. It has 2 pools, a spa and rooms with views of the Atlantic Ocean, or surrounding mountains. The Palma Romantica has bright, attractive decor with wooden furnishings. Each of its rooms has a balcony and a flat-screen TV. The Palma's spa has an indoor swimming pool and provides treatments, including massages. There is also a sauna, steam room and a jacuzzi. The hotel's Ã la carte restaurant serves Canarian cuisine and has a terrace, which offers impressive ocean views. Guests can enjoy a cocktail in the lounge bar. The Romantica has a range of sports facilities, including a gym and tennis courts. There are several walking routes in area, leading to viewpoints such as La Tosca and Los Tilos.